Mexico City is celebrating the 10th anniversary of its universal age pension. The programme was created in 2001 by Andrés Manuel López Obrador, who was mayor of the city at that time. In November 2003 the Legislative Assembly of the Federal District (Mexico City) converted the programme into law. The pension was initially given to all residents 70 years of age or older. The age of eligibility was lowered to 68 in the year 2009. Each pensioner receives a debit card. 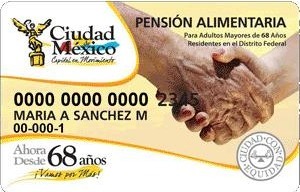 The pension – currently 897.3 pesos (75 dollars) – is credited to the card each month and pensioners can use it to purchase food and basic necessities in any of a number of supermarket chains in the city. Each pensioner also has access to free health care and free public transportation. Mexico City is an example for Mexico and the world. Its universal pension has functioned smoothly for 10 years, without a hint of corruption – this in a country that is not noted for absence of corruption. The pension is modest, but an important sum for many who live in a city where the minimum wage is only 57.46 pesos (less than 5 dollars) a day. And the pension is available to the elderly not as charity, not as welfare, but as a right, and without payment of bribes (‘mordidas‘). Andrés Manuel López Obrador once explained that he considered applying a means test to the age pension, but decided against it. How many of the elderly in Mexico City can be considered wealthy, he asked? No more than 5%! The administrative cost of removing such a small group from the pension list would exceed any fiscal savings. What López Obrador did not say, but is equally important, is that the absence of a means test limits the power of bureaucrats, who then find it difficult to demand money from an elderly person in order to ‘expedite’ his or her application. With means tests, bribes are common. In India, for example, tiny non-contributory age pensions are given to those on the BPL (Below Poverty Line) list. It is common knowledge that payment of a gratuity is very often necessary – and sufficient – to be classified as BPL. When the only requirement is proof of age and proof of residence, the bureaucrat has little control over the process. Berenice Balboa, “Recorrido por una década de Pensión para adultos mayores“, El Universal.df, 7 March 2011. HT Charles Knox of HelpAge International. This entry was posted on Friday, March 11th, 2011 at 03:23	and is filed under Pensions, Universal Transfers. You can follow any responses to this entry through the RSS 2.0 feed. Both comments and pings are currently closed.